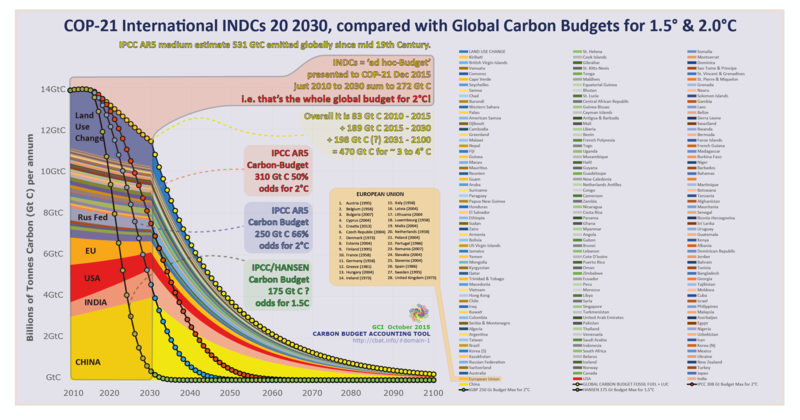 After the INDCs, is 2°C possible? The last few weeks have seen a flood of Intended Nationally Determined Contributions (INDC) arrive at the UNFCCC offices in Bonn, presumably to be included in the assessment of progress promised by the UNFCCC Secretariat for release well before the Paris COP21. There are now some 150 submissions and assessing them in aggregate requires some thinking about methodology. 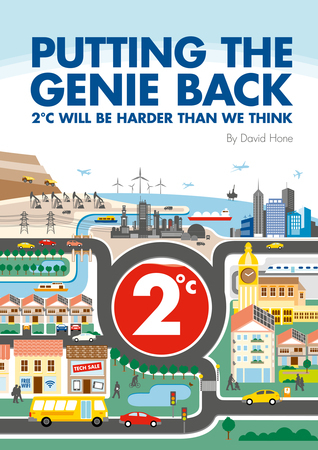 For starters, the temperature rise we will eventually see is driven by cumulative emissions over time (with a climate sensitivity of about 2°C per trillion tonnes of carbon – or 3.7 trillion tonnes CO2), not emissions in the period from 2020 to 2025 or 2030 which is the point at which most of the INDCs end. 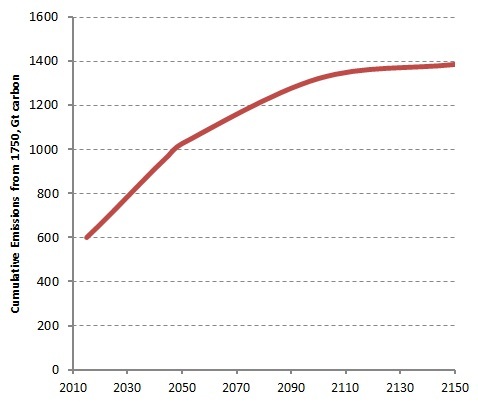 In fact, 2025 or 2030 represent more of a starting point than an end point for many countries. Nevertheless, in reading the INDCs, the proposals put forward by many countries give some clues as to where they might be going. For Europe, the USA and many developed economies, the decline in emissions is already underway or at least getting started, with most having already said that by mid-century reductions of 70-80% vs. the early part of the century should be possible. But many emerging economies are also giving signs as to their long term intentions. For example, the South Africa INDC proposes a Peak-Plateau-Decline strategy, which sees a peak around 2020-2025, plateau for a decade and then a decline. Similarly, China has clearly signalled a peak in emissions around 2030, although with development at a very different stage in India, such a peak date has yet to be transmitted by that government. Use an 80/20 approach, i.e. assess the INDCs of the top 15-20 emitters and make an assumption about the rest of the world. My list includes USA, China, India, Europe, Brazil, Indonesia, South Africa, Canada, Mexico, Russia, Japan, Australia, Korea, Thailand, Taiwan, Iran and Saudi Arabia. In current terms, this represents 85% of global energy system CO2 emissions. 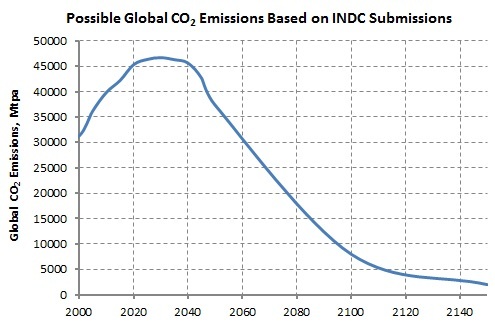 For the rest of the world (ROW), assume that emissions double by 2040 and plateau, before declining slowly throughout the second half of the century. For most countries, assume that emissions are near zero by 2100, with global energy emissions nearing 5 billion tonnes. The majority of this is in ROW, but with India and China still at about 1 billion tonnes per annum each, effectively residual coal use. Cement use rises to about 5 billion tonnes per annum by mid-century, with abatement via CCS not happening until the second half of the century. One tonne of cement produces about half a tonne of process CO2 from the calcination of fossil limestone. Land use CO2 emissions have been assessed by many organisations, but I have used numbers from Oxford University’s trillionthtonne.org spreadsheet, which currently puts it at some 1.4 billion tonnes per annum of carbon (i.e. ~5 billion tonnes CO2). Given the INDC of Brazil and its optimism in managing deforestation, I have assumed that this declines throughout the century, but still remains marginally net positive in 2100. I have not included short lived climate forcers such as methane. These contribute more to the rate of temperature rise than the eventual outcome, provided of course that by the time we get to the end of the century they have been successfully managed. Cumulative emissions currently stand at 600 billion tonnes carbon according to trillionthtonne.org. The end result of all of this are the charts below, the first being global CO2 emissions on an annual basis and the one below that being cumulative emissions over time. The all important cumulative emissions top out just below 1.4 trillion tonnes carbon. The trillionth tonne point, or the equivalent of 2°C, is passed around 2050, some 11 years later than the current end-2038 date indicated on the Oxford University website. My end point is the equivalent of about 2.8°C, well below 4+°C, but not where it needs to be. The curve has to flatten much faster than current INDCs will deliver, yet as emissions accumulate, the time to do so is ticking away. 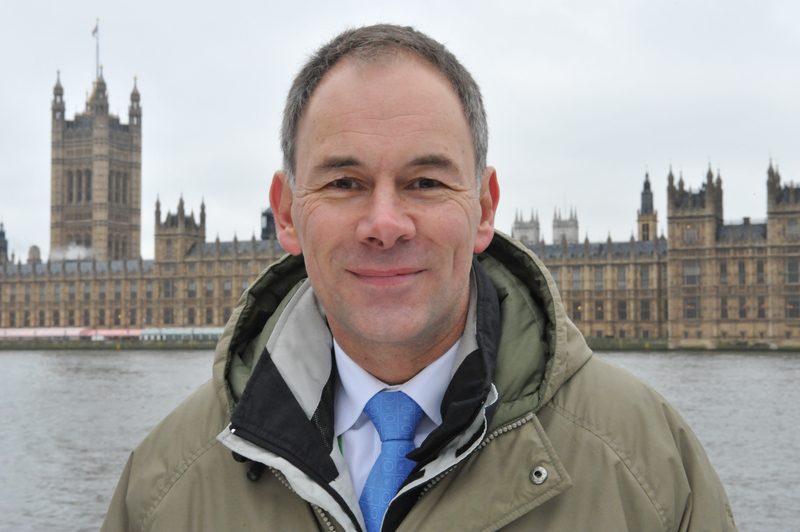 Even with a five year review period built into the Paris agreement, can the outcome in 2030 or 2035 really be significantly different to this outlook? Will countries that have set out their stall through to 2030 actually change this part way through or even before they have started along said pathway? One indication that they might comes from China, where a number of institutions believe that national emissions could peak well before 2030. However, the problem with accumulation is that history is your enemy as much as the future might be. Even as emissions are sharply reduced, the legacy remains. Nevertheless, we shouldn’t feel hopeless about such an outcome. Last week I was at the 38th Forum of the MIT Joint Program on the Policy and Science of Global Change and I was reminded again during one of the presentations of their Level 1 to Level 4 mitigation outcomes which I wrote about in my first book, 2°C Will Be Harder than we Think. These are shown below. Taking no mitigation action at all results in a potential temperature distribution with a tail that stretches out past 7°C, albeit with a low probability. However, we can’t entertain even a low probability of such an outcome, so some level of mitigation must take place. While Level 1 remains the goal (note however that the MIT 2°C is not above pre-industrial, but relative to 1981-2000), MIT have shown that lesser outcomes remove the long tail and contain the climate issue to some extent. The INDC analysis I have presented is similar to Level 2 mitigation, which means the Paris process could deliver a very substantial reduction in global risk even if it doesn’t equate to 2°C. 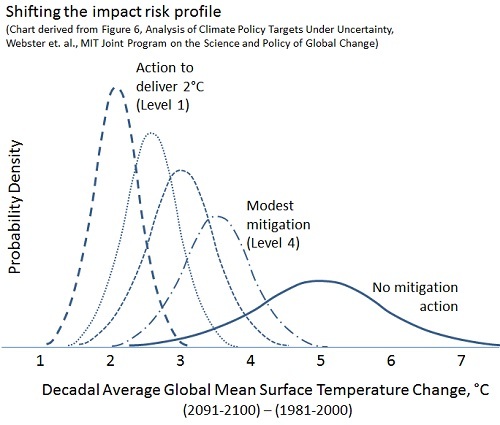 More appreciation of and discussion around this risk management approach is required, rather than the obsession with 2°C or global catastrophe that many currently present. Of course, extraordinary follow through will be required. Each and every country needs to deliver on their INDC, many of which are dependent on very significant financial assistance. I looked at this recently for Kenya and India. Further, the UNFCCC process needs its own follow through to ensure that global emissions do trend towards zero throughout the century, which remains a very tall order.